Not only does the library have a long and complex history and politics, but it has an ambivalent presence in Western culture – both a site of positive knowledge and a site of error, confusion, and loss. Nevertheless, in literary studies and in the humanities, including book history, the figure of the library remains in many senses under-researched. This collection brings together established and up-and-coming researchers from a number of practices – literary and cultural studies, gender studies, book history, philosophy, visual culture, and contemporary art –with an effective historical sweep ranging from the time of Sumer to the present day. 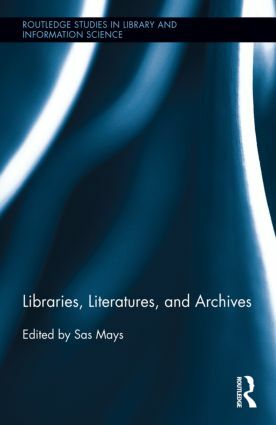 In the context of the rise of archive studies, this book attends specifically and meta-critically to the figure of the library as a particular archival form, considering the traits that constitute (or fail to constitute) the library as institution or idea, and questions its relations to other accumulative modes, such as the archive in its traditional sense, the museum, or the filmic or digital archive. Across their diversity, and in addition to their international standard of research and writing, each chapter is unified by commitment to analyzing the complex cultural politics of the library form. Sas Mays is Senior Lecturer in Cultural and Critical Theory in the Department of English, Linguistics, and Cultural Studies at the University of Westminster, London. His overall research concerns mediations of cultural memory through technological and archival forms, from the textual to the visual, and the analogue to the digital.